My guilt free addiction to greeting cards. Coffee, cake, friends and learning to work alone. Demystifying the commission process” or “How to get me to paint exactly what you want"
Hello. My name is Sarah Duffield and I am a full time artist. My big, exciting, Horsham district year of culture commission. Possibly one of the most photographed trees on the South Downs, a place to sit and think, to make decisions and just be. For me this is a happy place, full of warmth and joy. For others I suspect this spot is seeped in sadness, loss or regret. What colour do you paint a place which is so full of emotion? 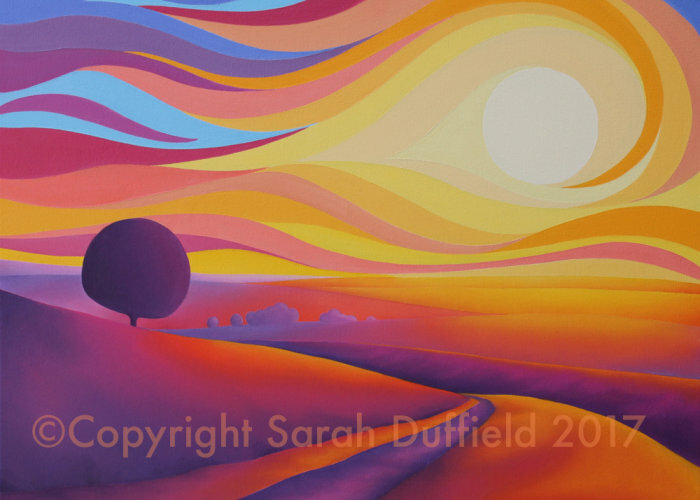 A lovely, bright little painting of "that tree" on Cissbury ring. Capturing the warmth of a summers sunset and the solitude that can be found in our landscape. This original 50 x 40 cm painting has now sold. 40 x 48 cm including border. Limited Edition of fifty, twenty of which are available via my website. Greeting cards and mini prints can be found in my greeting card/mini print gallery costing just £3 and £25 each. Hit the pink button for my General Newsletter signup, the blue button will take you to my Art workshop newsletter sign up. © Sarah Duffield Art. All rights reserved.